This interactive feature allows you to experience the three handling modes of the Bugatti Veyron, based on the Grand Sport Vitesse. With a top speed of 410 km/h, it is the fastest production roadster ever. In order to guarantee optimum handling at all times with this level of power, the supercar needs a harmonious balance between lift and downforce at all speeds. The Vitesse accelerates from 0 to 100 km/h in a breathtaking 2.6 s. It is driven in standard mode at speeds up to 180 km/h. The design of the car offers optimum aerodynamic properties in this speed range. For speeds over 180 km/h, the Bugatti switches to handling mode. In order to increase downforce and reduce wind resistance, the front of the car is lowered by 90 mm and the rear by 102 mm. At the same time, the front diffuser flaps open. The rear wing and additional rear spoiler are fully extended to support the turning dynamics. For speeds over 375 km/h, the Bugatti is driven in top speed mode. This mode must be enabled with the top speed key before driving. The steering is restricted, and the car is lowered even further. The front diffuser flaps close again, and the rear spoiler and wing are retracted. When braking from speeds over 200 km/h, the rear wing becomes an airbrake. In less than 0.4 seconds, it is inclined to a 55-degree angle. The maximal air resistance that this creates and the strong rear downforce increase the deceleration values from 1.4 G by an additional 0.6 G while maximising the braking stability. Very few parts, components or systems from existing vehicle concepts could be used in the Veyron. Everything had to be developed from scratch to achieve the required performance before being incorporated into the vehicle. When creating the Veyron, designers regularly drew inspiration from other industries which required extreme speeds and demanded extreme stress loads from materials and systems. 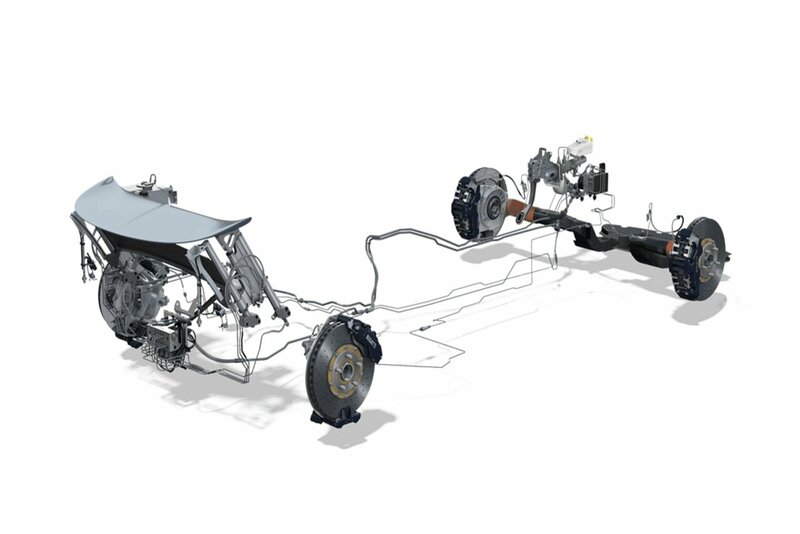 The Veyron minus its interior and exterior components – the so-called “rolling chassis” – can be divided into three sections: the front end, the monocoque and the rear chassis. The main components in the front end are all the air-to-liquid intercoolers, the starter battery, the luggage compartment, the front axle differential and the steering system. 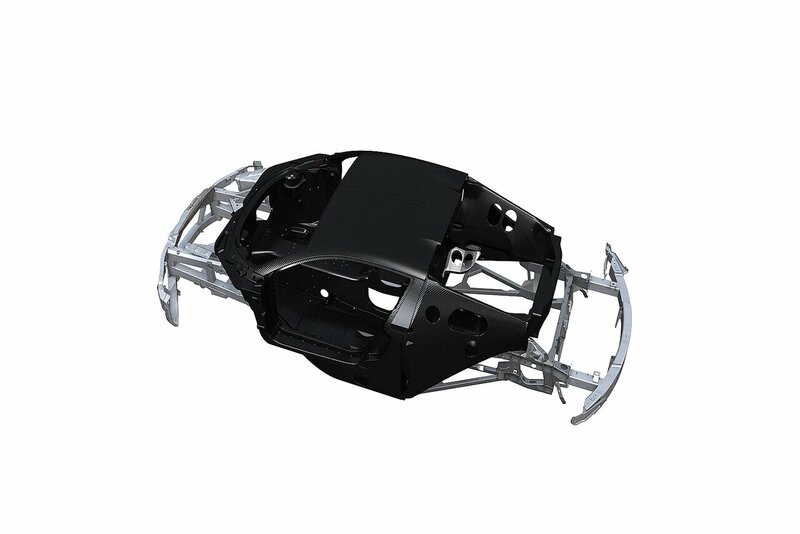 The front frame is the structural element of the front end, which houses all these components. The monocoque section is built around the monocoque itself, which is the main structural element of this section. The main components of the monocoque section are the fuel system (albeit without filler necks), the accompanying fuel tank (installed in the rear of the monocoque), the crossbeam including the control panel, the steering column, the pedals with brake servos and master brake cylinder, and the air conditioning system. The rear chassis section comprises the engine, gearbox and exhaust system, as well as the fuel system components: the engine and gear oil circuits, central hydraulics, filler necks and carbon canister. The front axle is divided between the front end and monocoque sections. The front transverse link connections, stabiliser and steering gear are attached to the front end section. However, the rear transverse link connections and steering column are mounted on the monocoque section. The term “monocoque” refers to a single large body that is manufactured as a single piece. The Veyron has a carbon fibre monocoque with a prepreg design. The term “prepreg” means that carbon fibre sheets are used that have been pre-impregnated with resin so that no additional resin needs to be added during the subsequent manufacturing process. The monocoque has a sandwich structure with an aluminium honeycomb core encased on both sides by sheets of carbon fibre. The main function of the front end structure, apart from housing numerous vehicle components, is to provide outstanding crash properties. Since it is virtually impossible for the monocoque to deform in case of a crash, all the crash energy dissipates in the front end. This ensures constant optimum safety for Veyron drivers and passengers: a front end that is deliberately designed to be deformable thanks to extruded aluminium multi-chamber profiles, combined with a virtually undeformable passenger compartment. The aim of the rear carbon fibre structure is to maintain the extremely high torsion rigidity of the monocoque in full right through to the point where the rear suspension struts are connected. 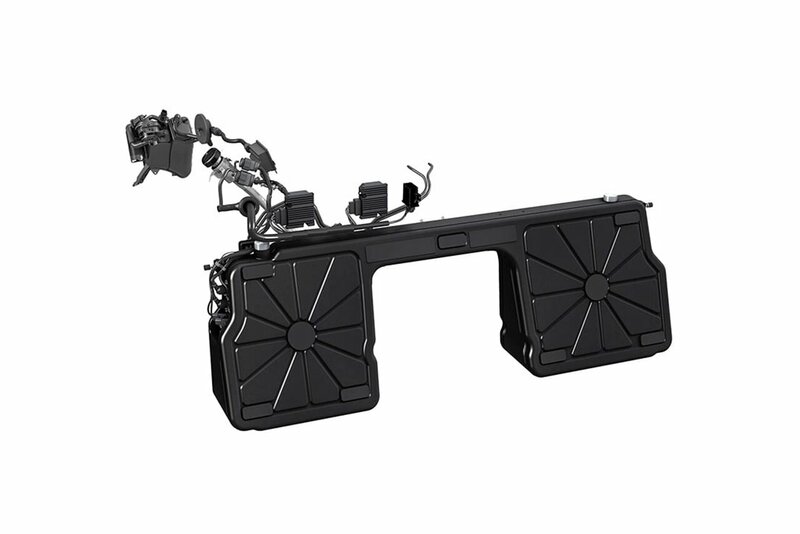 This is the only way to perfectly interlock the sections of the chassis and achieve outstanding lateral and longitudinal dynamics in all driving situations. Because it has two carbon fibre longitudinal members, which was unique at the time it was made, it is able to do this even without the usual transversal-bracing over the engine, which opens the W16 engine to view and further optimises the venting of the engine compartment. Optimum crash properties are also required in the rear of the car. Accordingly, highly deformable extruded multi-chamber aluminium profiles are installed in the area behind the exhaust system. Due to the turbochargers and exhaust system, extremely high rigidity is required in a very hot environment in the lower area of the rear chassis. For this reason, extremely strong, aviation-grade stainless steel was chosen for the two triangular longitudinal frames and the box-shaped rear axle carriage frame. These stainless steel components are made of the same material as the Veyron’s transverse links and were welded by employees who have been specially trained and certified according to aviation industry standards. The heart and soul of the Veyron is the 8-litre W16 engine with four turbochargers, which initially generated 1,001 PS, and an incredible 1,200 PS in later models. The engine is fully capable of operating under a continuous full load, a feat that engines designed for use in motor racing cannot achieve. 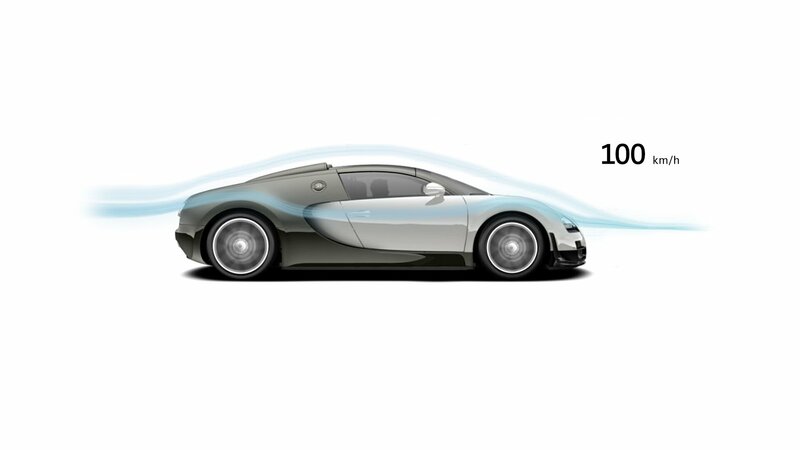 The only visible external sign of the Bugatti Veyron’s air inlet system is two air scoops. These scoops direct a flow of air into the two air filters, each of which supplies two turbochargers. The air end on each turbocharger compresses the air before feeding it through the two intercoolers and throttle valves into the two inlet manifolds. The exhaust gases, in turn, power the four turbochargers and pass through the catalysers into the 68-litre titanium exhaust system. From there, the exhaust gas is vented out into the open air through four tailpipes – two visible on the vehicle tail and two concealed in the rear diffusor. 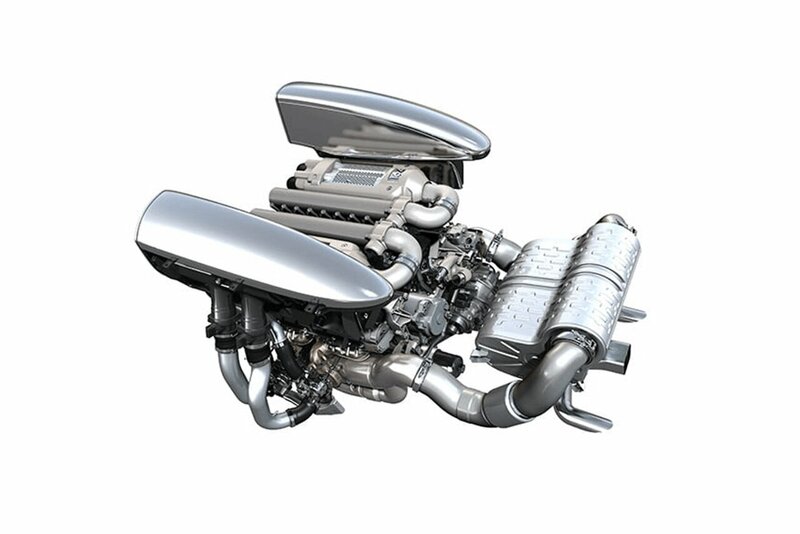 The Bugatti Veyron engine is designed in a so-called W configuration. Unlike other W engines made by Volkswagen, it has a 90 degree bank angle. Each bank has eight cylinders in a VR arrangement, ensuring optimum use of the available space. The crankshaft has eight large-end bearing sockets, with two large-end bearings per socket. In contrast to the usual positioning of auxiliary units on the engine, with the W16 engine they are positioned in a separate ancillary system holder behind the engine. This makes optimum use of the available space and protects the ancillary systems from excessive heat from the turbochargers and catalysers. Each cylinder has four valves: two supply it with inlet air and two more vent out exhaust gases. Four chain-driven overhead camshafts operate the valves (of which there are 64 in total). The Veyron is equipped with the dual-clutch gearbox (DSG), which is the fastest gearbox in the world. Bugatti was the first manufacturer to use a seven-speed variant of the DSG. Designed specially for the new sports car, this gearbox has a job which any other gearbox would baulk at, i.e. to transfer engine torque of up to 1,500 Nm to the road surface. The seven-speed dual-clutch gearbox comprises two clutches with four gears each: one for the even and reverse gears, and the other for the odd gears. The actuator block, which controls the clutches and valves, is located between the two clutches. The downforce is transmitted to the rear axle along the right-hand side relative to the direction of travel. The shaft runs from here to the rear axle differential between the turbochargers and engine block. The downforce is transmitted to the cardan shaft, and hence the front axle, via the front end of the gearbox. 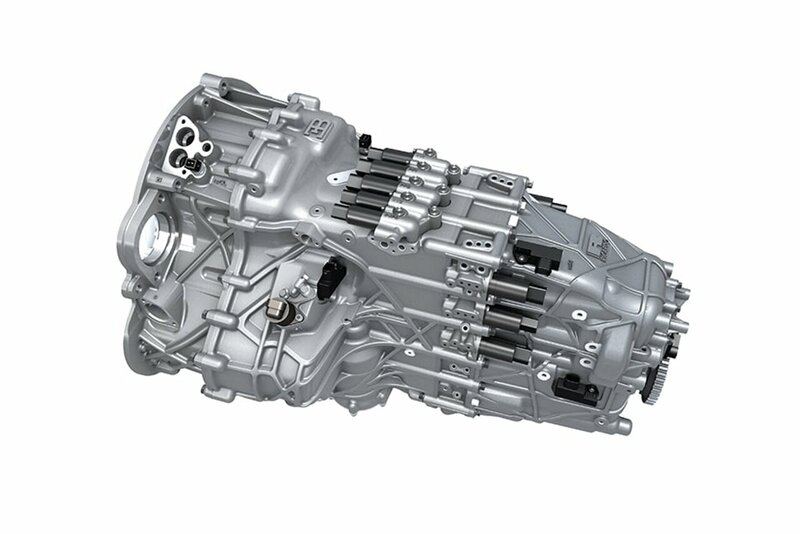 The even and reverse gears are located in the front section of the gearbox housing and are connected to the dual clutch via a long shaft. The gears 1, 3, 5 and 7 are located in the rear section of the gearbox housing. A short, coaxial hollow shaft encompasses the drive shaft for the even gears, connecting them to the dual clutch. A dual-clutch gearbox is, to all intents and purposes, an automatically operating manual gearbox. This means that automatic hydraulic systems are not only used to open and close the two clutches but also to select individual gears. The requisite clutch and valve actuator is located in a central block between the two clutches. The actuator performs functions such as shifting the shift dogs in order to switch the seven gears. In a high-performance vehicle such as the Veyron, it is essential that the engine is always supplied with constant fuel pressure. This also required a new development, and so Bugatti invented three-phase injection pumps which, unlike conventional plus/minus polarised pumps, are able to supply the engine with the required amounts of fuel continuously at a constant pressure. The adaptive boost-pressure fuel injection system constantly monitors inlet pressure and injects fuel into the combustion chambers at a constant level of excess pressure to ensure optimum atomisation and carburation, achieving maximum power with minimum fuel. Although the Bugatti has two visible filler flaps on the outside, only the flap on the right-hand side is used for refuelling; the left-hand flap is used for checking and refilling the engine oil tank. A fuel pipe channels the fuel to the base of the fuel tank, preventing the outgassing that uncontrolled fuel influx would cause. At around the halfway point, the emergency fuel pipe branches off from this fuel pipe in order to ensure that, when refuelling from a five-litre canister (as specified in law), both catch tanks are adequately filled so that the engine will start. Four ejectors – two in each half of the saddle tank – pump a large volume of fuel into a collecting tank at low pressure. The collecting tank then distributes the fuel to the two catch tanks. A secondary feed flow supplies the ejectors with a small quantity of fuel at high pressure, which draws large quantities of fuel out of the main feed pumps by means of the Venturi effect. The main feed system comprises two AC main feed pumps. They both have a dedicated control device which analyses data on the current inlet pressure and the engine requirements in order to calculate and set the required rotational speed for the main feed pumps. The fuel runs from the two main feed pumps into the Krontec module, which comprises the fuel filters, pressure relief valves, rollover valves and secondary flow regulators. The carbon canister for venting the tank is located behind the right-hand rear wheel. It filters toxic gases that can result from outgassing of the fuel and, together with inlet air obtained from the outside, channels them to the engine to be burned. At the time, the brakes on the Veyron were by far the most powerful brake system in the automotive industry. The ceramic discs, with a diameter of 400 mm and 38 mm thickness at the front axle, and a diameter of 380 mm and 36 mm thickness at the rear, were pioneering technology at the time in terms of material, size and structure for further developments in the super sports car area. With the help of the active rear wing, decelerations from high speeds were thus achieved at far more than 2 g, which corresponds, for example, at 320 km/h to a braking output of 5,600 kW. The ESP is fully operational all the way to the top speed of about 385 km/h, achievable in handling mode, which itself has been tested and released in very elaborate and unprecedented trial runs in September 2005 on the Black Rock Desert Salt Lake in the U.S. on low friction numbers. The materials and design of the brake disc are of particular importance if one wants to implement very high performance in a street-legal vehicle. In racing, the so-called cold braking performance is irrelevant: the materials of disc and pad are always “warmed up” before they develop their full performance capabilities. However, this is impossible in an everyday vehicle, such as the Veyron, because in every situation, from the cold start at -40°C all the way up to highest temperature situations around 1,100°C at the disc surface, there has to be a constant and good friction coefficient. The brake disc chambers are made ​​of titanium alloy. The advantage of titanium is that its thermal expansion is very similar to the very low thermal expansion of a ceramic disc, unlike any other metal, and also features a superior ratio of both stiffness and strength to weight which holds up well even at very high temperatures. The front axle calipers have four pads with a pad friction area totaling 320 cm2 per pad, and each pad has eight brake pistons also made ​​of titanium alloy. The deciding factor for a stable braking behavior - and thus for the safe and superior drivability in every driving situation - is the distribution of the wheel contact force between front and rear axles. During braking, the front axle load increases and the rear axle load decreases which can quickly lead to critical driving situations when the relief of the rear axle is too strong. Not so with the Veyron, because here the maximum front axle weight is just 60 percent, so even with the strongest braking maneuver, 40 percent still remain on the rear axle. This is achieved through the use of an active rear wing, an engineering feat that, at that time, didn’t exist in any automobile. When the brakes are activated, the rear wing angles up in a little less than 0.4 seconds from 15° to 55°, thus greatly increasing the downforce on the rear axle and greatly involving the rear axle in the braking process. The result: the Veyron remains impressively stable, even when approaching curved sections at very high speeds, requiring a considerable slowdown, or when a suddenly swerving or lane-changing vehicle requires heavy braking on the fast Autobahn. Even the best brakes require a lot of air in order to properly function over many braking cycles. Due to the very slight discs and calipers, and the resulting low mass, the components feature a rather low heat capacity. The inflowing air from the front is caught by a shallow, funnel-shaped carbon fiber channel whose inlet extends over almost the entire width of the vehicle front and is initially directed to the center of the front end. 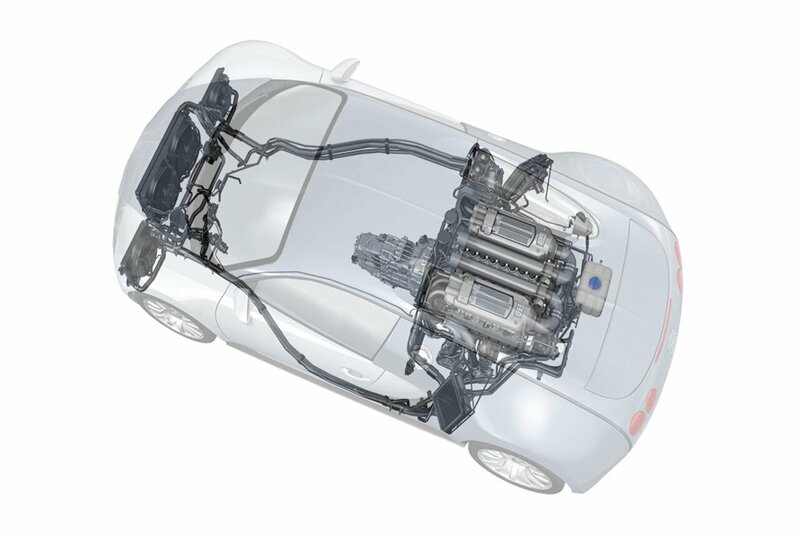 From there a part of the existing air is branched off in order to cool down the battery and the front differential. The larger portion of the air flow passes through brake cooling hoses to the swivel bearings. Inside of these is a spiral-shaped channel which accelerates the air flowing from the air hoses in the direction of the rotating disks and guarantees a low-loss transfer from the swivel bearings to the rotating disks. As for the body itself, a stall of the airflow is brought about deliberately in front of the wheel wells which causes the air to be sucked from the rims and the wheel wells, and thus causes a very good discharge of the brake cooling airflow which is strongly heated in the disk. Cooling is an extremely important aspect of the Veyron. Sophisticated airflow patterns were devised to conduct sufficient cooling air to the vehicle’s radiators and extract hot air without compromising the vehicle design – a key consideration. During combustion, some 2,400 HP of additional heat is generated for every 1,200 HP of drive power. To cope with this, the Bugatti engine has two water circuits. The larger circuit contains 40 litres of coolant water in three coolers in the front section of the vehicle to keep the engine at operating temperature. The vehicle has five separate cooling circuits. The oil is cooled by three oil coolers on the sides of the vehicle, which are supplied with cool air via inlets behind the doors. Two of the three oil coolers are located on the right-hand side (relative to the direction of travel), while the third is on the left. The entire water cooling system – comprising a high-temperature and a low-temperature circuit – is located in the front end of the vehicle. The vehicle also has an oil-to-water heat exchanger to cool the hydraulic oil and two liquid-to-air heat exchangers to cool the charged air. The gearbox uses dry sump lubrication, enabling targeted pumping of the full volume of oil through the gear oil tank and gear oil cooler, which are both located on the right-hand side of the vehicle. The rear axle differential also has an active oil cooling system. The corresponding cooler is located on the right (relative to the direction of travel) behind the gear oil cooler. Like the gearbox, the engine uses dry sump lubrication. In order to ensure an ideal operating temperature at all times, the engine has both water and oil cooling systems. The engine oil tank and engine oil cooler are located on the left (relative to the direction of travel). The engine water circuit, also known as the high-temperature circuit, comprises three radiators in the front end of the vehicle: a large central radiator and two smaller side radiators. The two side radiators can be sealed off from the rest of the circuit by a thermostat in order to quickly reach the ideal operating temperature. The vehicle’s intercoolers use a liquid-to-air design. The water is pumped to the front end of the vehicle and cooled down by inflowing air. This generates the vehicle’s low-temperature circuit. The design ensures that the charged air is always being cooled, even when the vehicle is stopped. This enables, for example, a hot start with full engine power on days with high outdoor temperatures.